The evening light fades so quickly in September. It feels like only last week that the sun was setting late after nine o’clock and our nights were short with dawn flooding the bedroom around four. Now, it seems barely seven and candles are being lit and quilts thrown on the sofa. But for me, this is a time of great happiness. It’s hygge time. Time to get roasting, stuffing and braising. There still will be salad on our table most nights though, no one comes between me and lettuce. Not even nature. I stuffed the squash with cubes of lamb chop. Cook the lamb first to render the fat and give some colour to the meat. Then let it cool a little and shred it from the bone. And if you don’t have mushroom ketchup, use Worcestershire sauce. Be sure to have a gentle hand with the seasoning, those bottles pack a punch, and if you want chilli heat rather than warmth, add another chilli, or a sprinkle of chilli flakes. Heat the oven to high and prepare the filling. Sear the chops all over and add the onion, garlic and chilli to the pan. Turn the heat down and continue cooking until the onion is soft and translucent. Add the barley and rosemary and a fairly large splash of water. Let that reduce away for a few minutes then add the mushroom ketchup. Remove the lamb, let it cool a little so you can then take the meat from the bones and finely chop it. Mix back into the pan and stuff each squash to the top. Sprinkle over the nuts and put the lids back on. 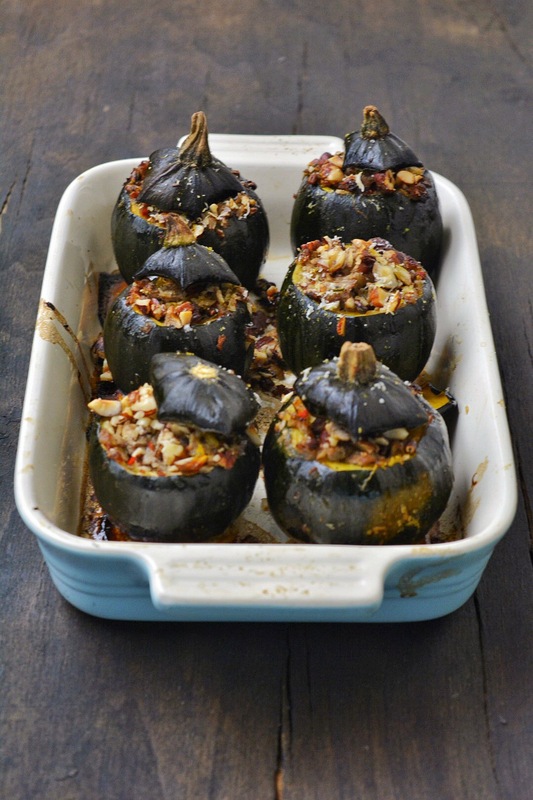 Roast in the oven for 35-40 minutes, until the squash are soft.